Why our legal copywriting services? Our legal copywriters understand the legal field – after all we are lawyers. We deliver succinct, lucid copy that drives results, yet always observe the standards of the legal profession. Effectively communicate with your online audience through precise legal copy. Use a niche copywriter that has a J.D. and law practice experience. Legal copywriting is a condensed message that conveys a specific point to your prospective clients or target audience. Think headings and subheadings in a legal brief or case theory. We all understand from legal writing that it takes effort and skill to write less but more. Copywriting delivers a clear message without superflous verbiage, even if there are underlying complex themes or strategies at work. Be visible the moment a potential client searches for your services. Brand yourself for future clients to hire or recommend you. When do I need legal copywriting services? You need legal copywriting services to write legal copy for direct advertising, content marketing, or any competent legal content strategy. In a nutshell, to accomplish any legal marketing goals. Legal copy should be well written for many sources, across a range of styles, and in different voices. Even if only for A/B testing to figure out what converts the best. Everybody searches and thinks in a unique way. Write for a wide audience. 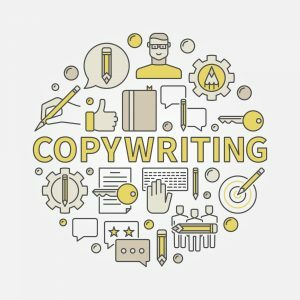 Where will I find legal copywriting services applied? Ads that appear in search engine results (i.e. Google or Bing), as banners in videos, or on relevant websites that permit third party advertisements. Online posts placed in the feed of an internal or external blog platform for online community involvement or as a response to existing information. As thoughts, feedback, reviews or any social minded strategies that get shared or liked across the internet, such as Facebook, Twitter, StumbledUpon and so on. Involves online reputation management, engagement in threads on public forums or even professional comments on relevant, trending topics. Conversation about your law practice and services in a more closed, secure environment to an individual or business that has showed interest in receiving communications. SEO friendly written content for your legal website so readers are inspired to hire you as their lawyer and the internet recognizes you as a relevant search query result. It really depends where you are with your legal marketing. At some point all of them will be needed. Website content for lawyers is a priority, you must have a competent online platform that gets noticed. A website with well written legal copy should be your priority. Ad copy is important for search marketing efforts as it draws search engine users to your website. Blog posts provide fresh content for your SEO relevance factor. Email marketing drops fresh content right into an interested readers’ lap. Forum commentary steps out into the World Wide Web and leaves a footprint. Social media is public relations, often used as a supporting strategy or online community interaction. We recommend a custom legal copywriting package, contact us to learn more.